The web site provides news and information about bridge in the county. Navigate the site using the menu down the left hand side. New information can be found in the list of Site Updates. The Site Map has links to all pages on this web site. Results of County competitions are usually published promptly on the site. Results from previous years are available, back to 1999 / 2000 for all competitions and earlier for some competitions. Prospective new members can download the welcome pack which provides a brief summary of what the county offers, how to find out more, and how to make your views felt. 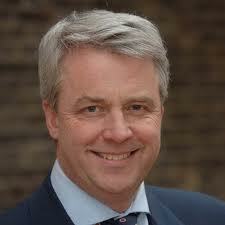 MP for Cambridgeshire South, Andrew Lansley, is the President of the Cambridgeshire and Huntingdonshire Bridge Association. Newsletter 67 (May 2014) published (or small version with no pictures). 10th May 2014: In the Garden Cities regional final Cambridge missed out on qualifying for the national final by 1VP. 2nd-5th May 2014: Jon Cooke reached the semi-finals of the Spring Foursomes.Catherine Curtis, Paul Fegarty & David Kendrick were 3rd in the Hamilton Cup. 1st May 2014: The County Teams Knockout was won by Mike Seaver, Simon Barb, Clive Stops & John Liebeschuetz. 30th April 2014: In the Cambs & Hunts League, Division 1 was won by Ely 1, Division 3 was won by Saffron Walden 1, and Division 4 was won by Ely 3. 27th April 2014: The County Swiss Pairs was won by Jon Cooke & Paul Barden. The Ascenders’ Prize was won by Roseanne Mattick & David Larman (moving up 11 places after round 3). 6th April 2014: Cambridge University won the Portland Bowl, beating Manchester in the semi-final and then the defending champions Imperial College in the final. The team was Tommy Brass (Captain), Alexandra Birchall, Adam Bowden, Stefan David, Kyle Lam, and Toby Nonnenmacher. 6th April 2014: In the national final of the National Pairs, Mary Knights finished 4th in the B Division. 5th April 2014: The Garden Cities qualifier was won by the Cambridge Club. 31st March 2014: Final Standings for 2013/14 season of the Eastern Counties League: Cambs & Hunts were 7th in the A Division, 6th in the B Division and 5th in the C Division. 29th March 2014: At the Norfolk Congress, Peter Bhagat & Mike Seaver finished 6th in the Norfolk Cup (Pairs). 23rd March 2014: Paul Fegarty & Catherine Curtis finished 16th nationwide in the Portland Pairs. 23rd March 2014: The County Pairs was won by Jon Cooke & Paul Barden. 22nd March 2014: The Novice Pairs was won by Hilary Duncan & Christine Lawton. 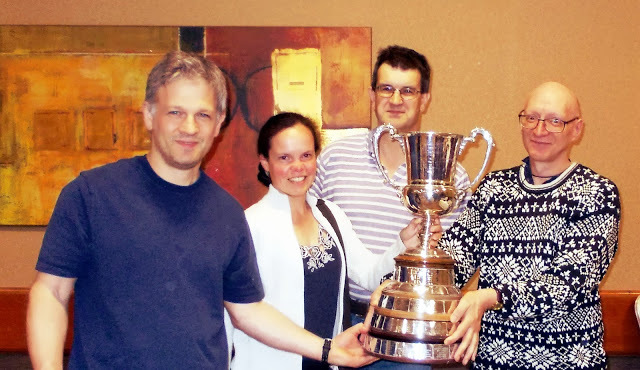 16th March 2014: In the regional finals of the National Pairs, Victor Milman & Nadia Stelmashenko finished 5th, Ufuk Cotuk & Mark Tilley finished 12th and Mary Knights finished 16th. 9th-10th March 2014: At the East Anglia Bridge Weekend, the highest-placed Cambs & Hunts players in the Swiss Pairs were Mike Seaver & Simon Barb who finished 4th, while Tanawan Watts & Alison Lloyd finished 7th. In the Swiss Teams, the highest-placed Cambs & Hunts players were Paul Fegarty & Catherine Curtis who were in the team that finished 2nd, while Niel Pimblett, Matthew May, Ross Midgley & Chris Waites finished 8th. 23rd February 2014: The County Individual was won by Lorraine Waters. 22nd-23rd February 2014: In the Ranked Masters Pairs, Cath Jagger was 4th in the Premier Grand Masters, one place ahead of Catherine Curtis & Paul Fegarty; David Kendrick was 4th in the Grand Masters; Mike Seaver & Simon Barb were 10th in the Premier Life Masters; and Ian McDonald & Joanne Caldwell were 9th in the Life Masters. 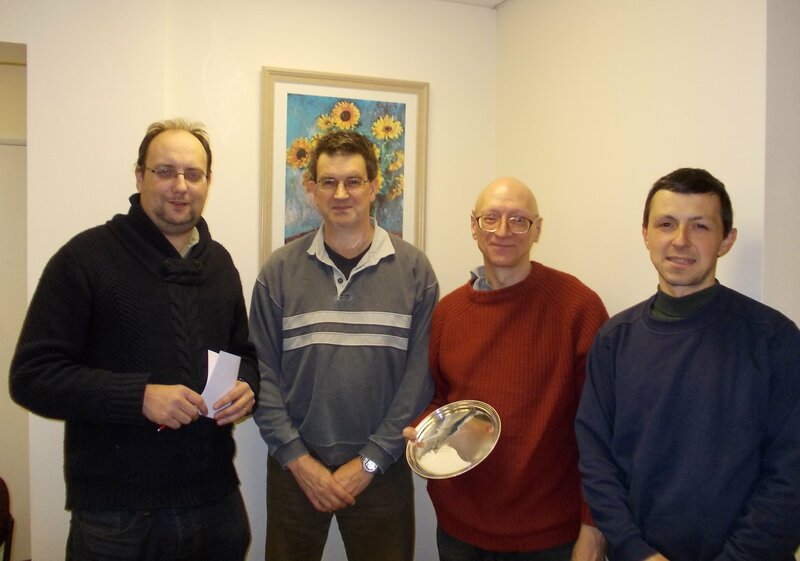 1st February 2014: The University’s President’s Teams was won for the third time in a row by Jonathan Mestel, Paul Barden, Graham Hazel & Jon Green. 24th-26th January 2014: Catherine Curtis finished second in the Lady Milne Trials to qualify to represent England in the 2014 Lady Milne (Ladies Home Internationals) in April. 18th-19th January 2014: At the National Teams Congress Chris Jagger was joint second in the Point-a-Board Teams event, while Nadia Stelmashenko, Victor Milman, Mike Seaver & Simon Barb were 9th in the Swiss Teams event. 10th-12th January 2014: Paul Fegarty, Catherine Curtis, Jonathan Mestel, David Kendrick & Chris Jagger represent the EBU (England's second team) in the first weekend of the Camrose Home Internationals, finishing in fifth place out of six, but only 11 VPs behind the leaders (Ireland). 4th-5th January 2014: David Kendrick's team lost in the play-off of the Senior European Trials after placing second in the round robin stage in December. 27th-30th December 2013: At the Year End Congress, Nadia Stelmashenko & Victor Milman were joint 7th in the Swiss Pairs, while Paul Russell & John Haslegrave were 11th in the Open Pairs. 23rd-24th November 2013: Cambs & Hunts finished fifth out of nine in their group at the Tollemache qualifier. The team was Paul Barden, Jon Cooke, Catherine Curtis, David Kendrick, Jonathan Mestel, Victor Milman, Julian Wightwick & Giles Woodruff. 16th-17th November 2013: David Kendrick's team won the Teltscher Trophy Trials to qualify to represent England in the 2014 Teltscher Cup (seniors Home Internationals) in May. 10th November 2013: In Division 1 of the Premier League Paul Fegarty, Catherine Curtis, Jonathan Mestel & David Kendrick finished fourth, one place ahead of Chris Jagger's team. Fegarty & Curtis were the third-placed pair on the Butler rankings. All five Cambridge players were selected to represent the EBU in the first weekend of the 2014 Camrose (open Home Internationals). Chris Jagger was also selected for the second weekend. 27th October 2013: The C&H Open Swiss Teams was won by Giles Woodruff, Mike Seaver, Julian Wightwick and Simon Barb. 18th-20th October 2013: At the Autumn Congree David Kendrick was 6th in the Two Star Pairs, Adam Bowden & Carina Negreanu were 6th in the Satellite Pairs, and Peter Last was joint 9th in the Swiss Pairs. Kendrick was also third in the Teams event for the Burlington Cup. Cambridge E (Peter Bhagat, John Liebeschuetz, Mike Seaver & Clive Stops) lost the final of the 2012/2013 NICKO Plate to West of England C.
In the first weekend of the Brighton Congress, Jon Cooke finished 8th in the Swiss Pairs and stayed on to win the Sunday evening Open Teams, while John Haslegrave & Paul Russell were 3rd in the Friday Midnight Speedball. In the second weekend Jon Cooke, Paul Barden, Jonathan Mestel & Cath Jagger finished 6th in the 'A' Final of the Swiss Teams. 21st July 2013: Graham Dolan, David Carmichael, Roger Courtney & Robin Cambery won the Essex/Herts One-Day Swiss Teams. Congratulations to Julian Wightwick, Jonathan Mestel, Paul Barden, Chris & Cath Jagger on winning the Pachabo. Marion & Trevor King and Chris & Christine Heames won the County Plate. The Cambridge Club (Julian Wightwick, Mike Seaver, Rod Oakford, Jonathan Mestel, Paul Barden, Cath Jagger, Jon Cooke, David Kendrick) finished fourth in the Garden Cities National Final. Julian Wightwick, Jonathan Mestel, Paul Barden, Chris & Cath Jagger won the County Knockout Teams. They will represent C&H in the Pachabo in June. Paul Fegarty, Catherine Curtis, Julian Wightwick & Jonathan Mestel lost in the semi-finals of the Hubert Phillips. Cambridge University A lost to Imperial College A in the semi-finals of the Portland Bowl. The last two remaining Cambs & Hunts teams in the NICKO played each other in Round 5 (last 32), with Cambridge A (capt. Chris Jagger) beating Thursday A (capt. Joanne Caldwell). In the NICKO Plate, Cambridge E (capt. Peter Bhagat) play Thursday B (capt. Brian Copping) in Round 4 (last 16). Congratulations to Tapan Pal & Abdel Abdelmoneim on their winning this well-attended event. Full results are available here. The complete list of prize winners is here. A detailed article on the event by Colin Sills is here. 1st April 2013: Nadia Stelmashenko and Victor Milman finished 9th in the Easter Congress Swiss Pairs. Andrew Hawthorn and Andrew Fenn won the Novice Pairs - the results are here. 17th March 2013: In the National Pairs Regional Finals, three Cambs & Hunts pairs qualified for the national final: Nadia Stelmashenko and Victor Milman, Julian Wightwick and John Liebeschuetz, and Rod Oakford and Mike Seaver. Rod and Sue Oakford won the County Pairs final - full result available from here. Norfolk provided the winners of the Swiss Teams with a fine 17VP margin; Cambridge placed a good second, with a tie for third. After seven rounds Derek Oram and Celia Oram from Hertfordshire were top of the field with a comfortable 16VP margin. Cambs & Hunts featured in places 2nd and 3rd - congratulations to Ian and Catherine and their respective partners. 2nd March 2013: In the Ranked Pairs, John Leibeschutz with Peter Foster won the Life Master Pairs. John Haslegrave with David Williams won the Regional Masters, Dominic Clark and Tanawan Watts were 3rd, and Henry Lockwood and Matt Johnson were 5th. 24th February 2013: Colin Payne from Huntingdon BC won the County Individual, retaining the title for the club (Malcolm Anderson won the competition last year). 16th February 2013: Cambridge Bridge Club (Julian Wightwick, Victor Milman, Jonathan Mestel, Jon Cooke, Rod Oakford, Mike Seaver, Paul Fegarty. Catherine Curtis) won the Garden Cities Qualifier. The Regional Finals will be run as all-play-all events on Sunday 18th May 2013; the National Final is played on Saturday 15th June 2013 at West Midlands Bridge Club in Solihull. 1st December 2012: NICKO 2011/2012 update: Cambridge A beat Cheltenham B in the final. The team for the final was Jon Cooke, Julian Wightwick, Jonathan Mestel and Chris Jagger. 18th November 2012: Cambs & Hunts qualified comfortably for the final of the Tollemache (Jonathan Mestel, Paul Barden, David Kendrick, Jon Cooke, Catherine Curtis, Paul Fegarty, Julian Wightwick, Giles Woodruff, npc Chris Larlham). 11th November 2012: Chris Jagger's team won the Premier League, earning them a Camrose match in January 2013. Paul Fegarty's team were 5th (Jonathan Mestel, David Kendrick, Catherine Curtis, Paul Fegarty, Jon Cooke). October 2012: Penny Riley has been awarded a Dimmie Fleming Award for her contribution to bridge in the county. NICKO 2011/2012 update: Cambridge B lost to Cheltenham B in their semi-final match. Cambridge A meanwhile won their semi-final against Young Chelsea L and therefore face Cheltenham B in the final, to be played in December. 23rd September 2012: ECL vs Beds: A team lost 0-20; B team lost 6-14; C team lost 9-11. 17th August 2012: Mike Seaver & Eric Campbell won the Consolation Final at the Brighton Seniors Congress. August 2012: Cambridge Bridge Club has two teams in the semi-finals of the NICKO: Cambridge A (Cooke/Jagger/Jagger/Mestel/Wightwick) and Cambridge B (Barb/Kendrick/Larlham/Milman/Stelmashenko). Jon Cooke reached the semi-final of the 2011/2012 Hubert Phillips mixed pivot teams championship. 15th July 2012: ECL vs Norfolk: A team lost 5-15; B team lost 0-20; C team won 17-3. 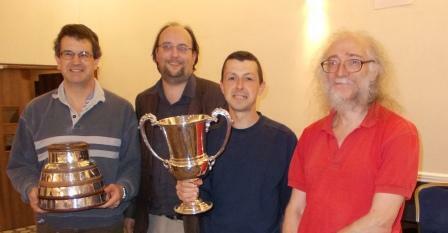 24th June 2012: Robert Miller & Ufuk Cotuk won the Northants Swiss Pairs. 23rd June 2012: In the Garden Cities National Final Cambridge Bridge Club finished third behind Chislehurst (Kent) and Young Chelsea (London). 17th June 2012: Chris Jagger, Jonathan Mestel, Jon Cooke & Julian Wightwick, representing Cambs & Hunts, won the Pachabo Inter-County Teams.